Flying visit? Fleeting sojourn? Determined to learn, see and taste the many beautiful elements that the City of Melbourne has to offer? This tour is the perfect combination of quirky Melbourne history, hidden hot spot discovery and chocolate. We will light your path of the city sights, show you where the locals love to linger and ensure you have a trail of wistful recollections to lead you back to your favourite places. Melbourne is full of gems and once you start, you’ll want to discover every part of it. With a maximum group of 12 chocolate and history loving enthusiasts, you have the opportunity to connect and share the local experience you long for. 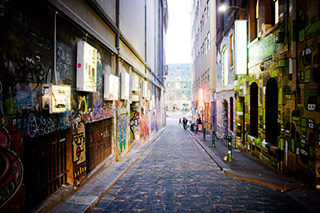 Our tour hosts are in the know when it comes to creating a memorable journey through Melbourne's hidden lanes. Prepare to be spellbound - you’ll never want to leave. The Block Arcade, 100 Elizabeth Street, Melbourne CBD.